Bathtub Chip Repair for Only $199 - We specialize in bathtub chip repair! We are proud to be one of the only Bathtub Repair companies in the US to be Authorized Service Representatives for warranty service and we also specialize in repairing bathtubs by the following manufacturers. It gives us inside access to the best methods and materials for your bathtub repair needs. "had another tub business cancel and reschedule FOUR times. Arnold called me right back and actually showed up a bit early so I could get to work and start my day. Terrific crack repair! Left everything clean and made my day." "Great company to work with and excellent follow up. Had 4 fixtures re caulked and everything looks great!!! Cleanup was spot on and even came back for a quick chip repair. Truly look to make their customers happy. Highly recommended!!!" "Arnold and his team arrived right on time during our agreed upon 1-hour window! They did a great job with the tub hole repair and explained everything to me along the way. They left the house clean and stuck to their e-mail estimated price." "We really appreciated the time spent, his knowledge, and a well repaired bathtub. You can't go wrong with Happy Tubs for bathtub repair. We will definitely be calling Arnold if any other problems arise!" "He was super knowledgeable, explaining and showing me every step of the process. He was also able to completely remove the bad repair job someone else did. the Happy Tubs rust repair looks amazing. I would refer them for a bathtub repair in a heart beat." "I am extremely satisfied with Arnold from Happy Tubs and the bathtub crack repair he did. I whole-heartedly recommend him. You can't ask for a better looking bathtub repair. Your tub will be in good hands." "After a leak was found in our garden tub during the home inspection, we almost lost the sale because I couldn't find anyone that repairs cracked tubs and has a warranty. Happy Tubs was quick with a response and fixed my bathtub in 1 day, very clear and reasonable price too!" "My toddler tipped over a candle on the grandparents garden tub, which melted it bad. Once I found Happy Tubs, they took care of the garden tub repair right away and were even able to get some other stains out of the surface. Highly recommended!" "The chip in my guest bathroom started to rust making me worry it would leak. I found Happy Tubs and after sending some pictures to the owner, we set an appointment for the repair. Showed up on time and its flawless! I would recommend." "Happy Tubs was a pleasure to do business with. Just like my realtor said, they came on time, fixed the rust by the overflow in my bathtub and left everything clean again!" "I wholeheartedly recommend Happy Tubs for bathtub repairs! One of my teenage sons chipped the bathtub and we had company coming over. Arnold was able to get the bathtub repaired the next day I called and it looks like it never happened!" "When the painters chipped my bathtub during the remodel I was devastated. A brand new tub we had just put in. I searched for bathtub repair near me and found Happy Tubs, the chip repair is amazing, you can't even tell the bathtub was damaged in the first place!" "My bathtub was damaged during the window installation. They dropped the window right on the ledge and cracked the cultured marble. 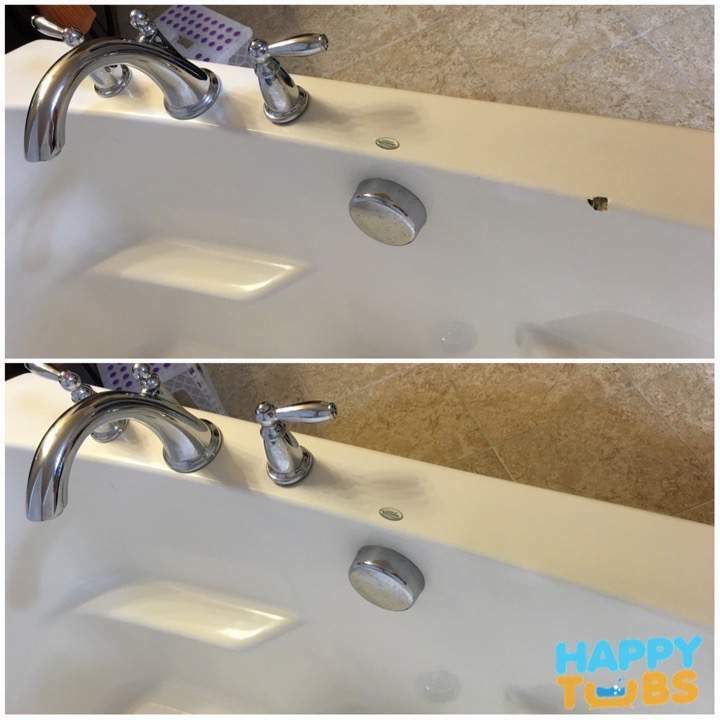 I found Happy Tubs when I searched for bathtub repair service near me and they did an amazing crack repair on my garden tub!" "Happy Tubs has the best bathtub repair service! They were able to fix a crack in the bottom of my tub and even added some extra support so the bathtub wouldn't crack again. The crack repair looks great and feels very strong!" "I am very happy and would recommend Happy Tubs to anyone, they have the best bathtub repair service near me! Fixed the many chips in my bathtub and made it look like new." "When my cat knocked over a mirror and cracked the bathtub in my master, I panicked thinking I would have to get it replaced. Arnold from Happy Tubs came to the rescue though and for about 10% of what replacement would have cost. It's the best bathtub crack repair company near me!" "I got some quotes on replacing my bathtub due to the large hole on the side my teen caused. I then looked online for bathtub hole repair near me and found Happy Tubs. They came out and did an amazing job on the bathtub. Recommended!" 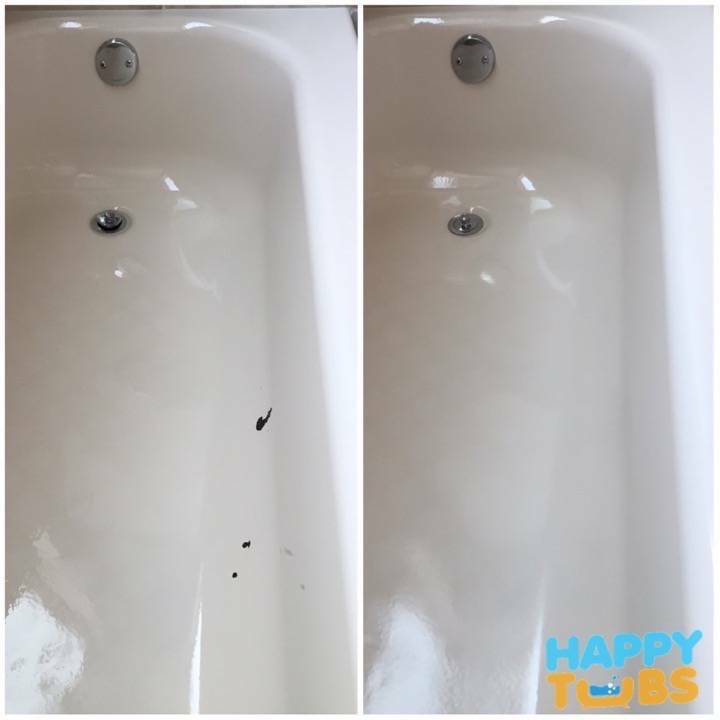 "Happy Tubs came out on time and repaired the 2 chips in my bathtub in only 1 hour and it looks amazing. They were also able to get me on the schedule fast and stayed within the quote they gave me for the chip repair." "I searched for bathtub repair in Arlington, TX after my realtor suggested we fix the chips in the tub prior to the sale. Found Happy Tubs and was impressed with the reviews. Met the owner and you can tell he truly wants to help people. I'm very happy with the chip repair as well!"